St. Ives is well-known for their amazing scrubs. They've always been my drugstore go-to when I need a reliable exfoliator to keep my skin polished and smooth. The newest members of their scrub family are the new Oil Scrubs which come in two varieties - Coconut Oil Scrub and Apricot Oil Scrub. 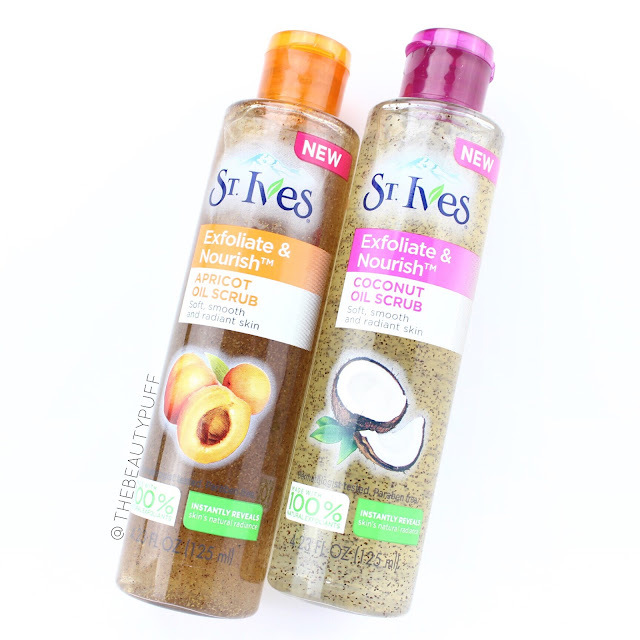 What makes St Ives Oil Scrubs different? The exfoliants in these scrubs are combined with nourishing oils to help hydrate and nourish skin as they exfoliate. You get the benefit of exfoliation as well as moisture from the natural oils. How To | With either of these scrubs, your first step is to shake the bottle. Then, rather than working into a lather like a typical cleanser, these oils get applied to dry skin. Take a small amount in the palm of your hand and distribute it onto your face. Massage the product thoroughly and then add water to help emulsify the scrub. It will turn a milky white as you add the water. Then, rinse to reveal silky smooth, hydrated skin! For the best results, use 3-4 times a week. Formulas | The new St Ives oil scrubs come in two varieties. The Apricot Oil Scrub contains walnut shell powder which provides a deeper exfoliation. The Coconut Oil Scrub contains coconut shell powder and coconut oil. The coconut shell provides a more moderate exfoliation. If you like a more gentle exfoliator, you'll love this one. Key Ingredients | Grapeseed oil provides gentle nourishment that won't clog pores or feel heavy on the skin. Results | I've loved using both of these scrubs lately. They smell great, exfoliate thoroughly, and don't irritate my sensitive skin. Best of all, my skin feels really hydrated and smooth after each use. Not something I can say for every exfoliator I've tried! I'll definitely continue to use these scrubs to keep my skin in check as we head into spring. You can find the St Ives oil scrubs on St Ives' website as well as Target.com below!